As part of Project Moving Forward, the Village of Waynesfield embarked on a project from 2014-2016 to upgrade and add to the village’s sewer lagoons – a $1.5 million project. The picture on the top is a Google image captured prior to the construction of the third lagoon in July 2014. The picture on the bottom was captured by Motteriffic Aerials October 19, 2016. 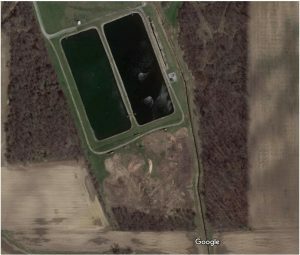 This overhead view of the Village of Waynesfield Water Treatment Lagoons shows the beginning process of purifying the village’s water. 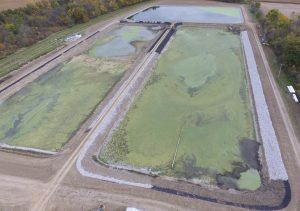 In 2016, the village added the third lagoon to satisfy EPA requirements and provide for additional growth in treated water usage provided by the Village of Waynesfield. Click here to see a video the new lagoons.